The Atmospheric Infrared Sounder (AIRS) is a grating spectrometer (R = 1200) aboard the second Earth Observing System (EOS) polar-orbiting platform, EOS Aqua. In combination with the Advanced Microwave Sounding Unit (AMSU) and the Humidity Sounder for Brazil (HSB), AIRS constitutes an innovative atmospheric sounding group of visible, infrared, and microwave sensors. The AIRS Support Products include higher vertical resolution profiles of the quantities found in the Standard Product plus intermediate output (e.g., microwave-only retrieval), research products such as the abundance of trace gases, and detailed quality assessment information. The Support Product profiles contain 100 pressure levels between 1100 and .016 mb. An AIRS granule has been set as 6 minutes of data. This normally corresponds to approximately 1/15 of an orbit but exactly 45 scanlines of AMSU-A data or 135 scanlines of AIRS and HSB data. The Level 2 retrieval products and climatology CO2 are assumed as the initial state for the Vanishing Partial Derivative (VPD) retrieval algorithm that separately determines the tropospheric CO2 mixing ratio. 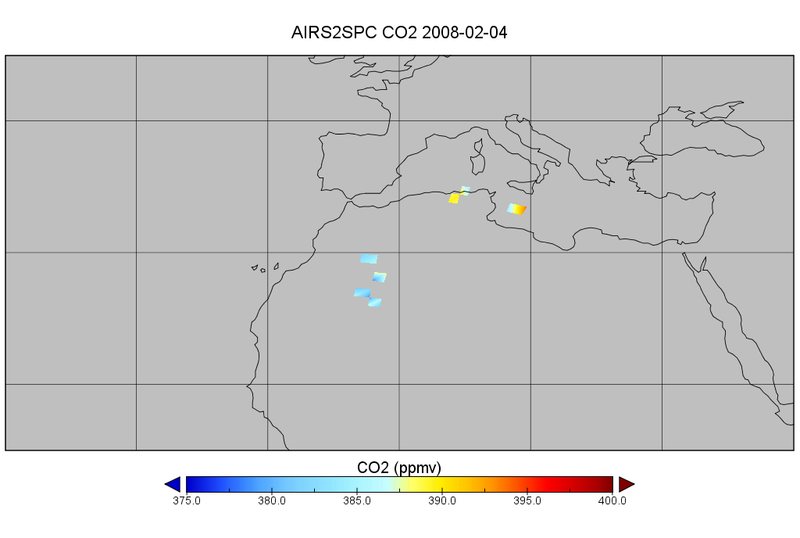 The AIRS Level 2 tropospheric CO2 product is the average of the solutions for a 2 x 2 array of adjacent AIRS Level 2 retrieval spots, covering a 90 km x 90 km area at nadir. Retrievals for which the solutions for the 2 x 2 arrays satisfy a spatial coherence QA that requires agreement of the separate retrievals to be within 2 ppm in an RMS sense are included in the standard product. Retrievals that fail this QA test are included in the support product. AIRS home page at NASA/JPL. General information on the AIRS instrument, algorithms, and other AIRS-related activities can be found.